The adult colouring book features images of the late rock star throughout the years. Since David Bowie passed away on Sunday 10 January 2016, tributes have continued to take place for the British icon all over the world. Now, Bowie fans can continue to celebrate the life of the late singer with a new adult colouring book. The book created by Royal College Of Art graduate Mel Elliot, consists of 30 black and white illustrations, which show the "full range of David Bowie's idiosyncratic and indelible looks throughout the years". Billed as "the ultimate colouring book," Elliot's illustrations feature Bowie as Ziggy Stardust, Aladdin Sane and the Thin White Duke, and give bite-sized information about the artists' journey. 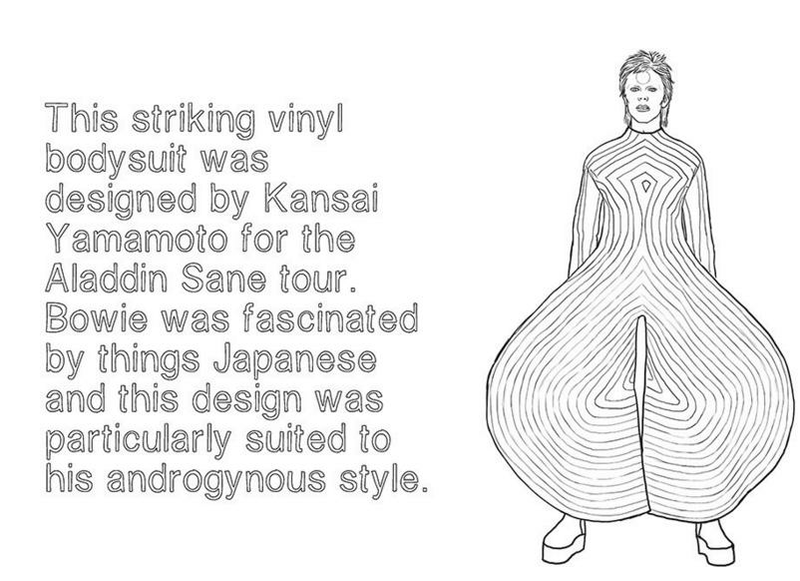 Bowie lovers and colouring-in enthusiasts can buy the book for £9.99 on Amazon. Meanwhile, two tribute concerts took place for the Jean Genie star this week at Carnegie Hall and Radio City Hall. Blondie, Toni Visconti, Mumford & Sons and R.E.M's Michael Stipe were among those paying tribute to the star by performing his biggest hits. David Bowie lost his private battle with cancer just two days after his 69th birthday, which coincided with what was to become his final album, Blackstar.